Click HERE to sign up for this e-newsletter. 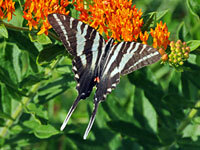 The Northern Virginia region's only "kite" swallowtail is the unmistakable Zebra Swallowtail. No other butterfly has its triangle-shaped, zebra-striped wings, which taper to long, graceful tails. Below, a brilliant red stripe slashes across the hindwing. The summer generation is larger and has proportionally wider stripes and longer tails than the spring generation. Look for Zebras sailing along watercourses or nectaring nearby in marshes and fields. Zebra caterpillars require pawpaw trees (Asimina triloba), a shrub or small tree that grows beneath taller trees in rich, damp woods. Ed Milhous runs TreesPlease, a consulting firm that provides landowners, managers and developers with information about lawns, landscapes, and trees in the DC region. Please join us Thursday evening for Ed's presentation on Lessons Learned from 25 years working in land development, including discussion on why developers hate trees so much, how cutting down trees can help save the Bay and what we can do to mitigate the devastation. Help create a wildlife hotspot at the Stone House backyard! Workday tasks include planting, weeding, mulching and removing invasive plants that try to sneak their way back. Bring a smile and a shovel. Wheelbarrows and gardening tools are also useful. The birds and butterflies will appreciate your help. Click HERE for for more information about this project. Stick insects, katydids, mantises, butterflies, moths and dragonflies are busy foraging and reproducing in fields and forests. They may be quiet, small and easy to pass by, but insects make the world go round. 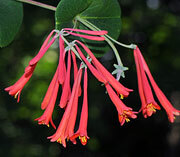 They pollinate plants, dispose of dead things and provide food for countless other animals. Join walk leaders Judy Gallagher and Kim Hosen for a closer look at insects we discover in fields and forest edges at Merrimac Farm. For more information and to register (appreciated), email alliance@pwconserve.org or call 703.499.4954. We'll look for birds and other wildlife, especially butterflies and dragonflies, as we travel through the uplands to the edge of the floodplain, covering a variety of habitats, including open fields and woodland edges. Everyone is welcome. Dress for the weather, bring binoculars and cameras. More info and RSVP (not required) to PWCA , 703.499.4954 or alliance(at)pwconserve.org. Speaker: Tom Dombrowski is an Environmental Engineer with Prince William County Department of Public Works Watershed Branch, specializing in wetlands, streams and environmental assessments. This program is part of PWCA's Stream Stewards, more information is online HERE.